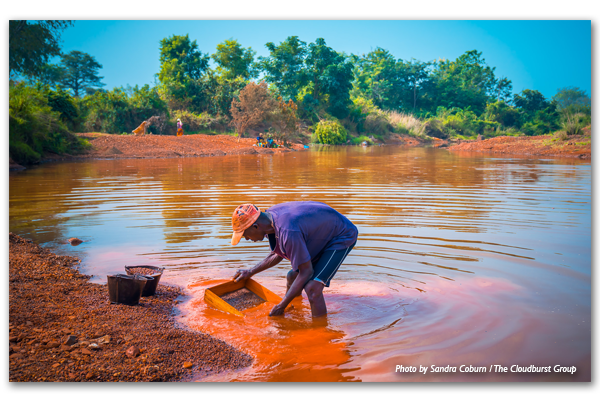 The artisanal mining sector in West and Central Africa is a rapidly expanding economic force employing millions of young people, often those who are the most vulnerable. Numerous ancillary informal economies are associated with the export of what are commonly known as “conflict minerals” such as diamonds, gold and coltan. Women grow crops and process food for the labor force of young men digging deep into the ground to pull out the ore and precious metals and stones. Shopkeepers and other merchants sell tools and supplies to the communities built up around the rich yet dispersed mineral resources of the regions. Complex flows of capital and credit reach the most remote parts of the continent to pre-finance the extraction and sale of conflict minerals. Few recognize the importance of property rights in these flourishing economies. Two USAID activities – the Property Rights and Artisanal Diamond Development Project II (PRADD II) project, which works in Côte d’Ivoire and the Central African Republic, and the Capacity Building for Responsible Minerals Trade (CBRMT) project, which works in the Democratic Republic of the Congo – know that securing rights and access to subsurface minerals is critical to sustainable resource management and transparency. Based on years of experience, PRADD II and CBRMT developed and refined approaches and techniques to help governments formalize land ownership to two asset classes – the bundle of surface rights (land, trees, water, etc.) and the sub-surface rights often viewed by the state as its exclusive domain. The formalization process is complex because there is often a disconnect between national law and the reality on the ground. Even though land policy and laws may transfer ownership of land to the state itself, and then to mining companies through concessions, rural populations often contend that customary tenure arrangements still prevail and that both surface and sub-surface resources belong to them. There’s no easy way out of this conundrum, but the PRADD II and CBRMT experiences show that both the state and customary authorities must be brought into the process of resource tenure formalization. This is particularly true for post-conflict countries, where the authority and legitimacy of customary authorities over these resources often supersedes the power of the state. In post-conflict environments the state is commonly weak and is unable and/or unwilling to clarify and formalize the institutions and rules governing access to mineral resources, in part because these resources are often illegitimately funding the purchase of weapons and ammunition (by special interests that hold considerable power and authority over government itself). As is often the case, once diamonds are found in an area, hundreds of people invade the area to try their luck. If the site is indeed productive, it becomes well known throughout the country. Outside investors are sometimes attracted to the area to try their luck as well. At this point, the diamond diggers might be surprised when an agent of a foreign owned company arrives one day to say, “I have a government issued permit in my hand. I own the concession under this land, and this site is now mine. You are to leave immediately.” The diamond diggers refuse, and go to the local authorities to complain. The regional representative of the Ministry of Mines might throw up his hands, “Well, you know, the law states that all sub-surface mining rights belong to the state, so you really are illegally mining the land and you have no rights. The concession permit is valid so you must depart immediately or we will bring in the police to evict you.” Deeply disappointed, the villagers return home to plan how to respond to the threat of expropriation. And so, the tensions grow. The outcome is uncertain. Formalizing supply chains for artisanal minerals, including through the formalization of rights and access to subsurface resources, is an important step to establishing responsible supply chains. USAID, through PRADD II and CBRMT, is a pioneer in assisting governments and the private sector in this complex endeavor. However, these USAID projects reveal that this approach can lead to the exclusion of some actors (including the state), particularly those who have long benefited from an opaque tenurial status and the associated lack of clearly recognized and secured rights. When customary authorities are inadvertently excluded, they mount surprisingly effective forms of protest and resistance. Angry villagers have sabotaged diamond mining companies in the Central African Republic because operators failed to respect areas set aside for artisanal mining. Similarly, village diamond miners in Côte d’Ivoire brought a diamond mining company to its knees by threatening to destroy buildings and equipment unless the concessionaire’s permits were opened up to artisanal mining. 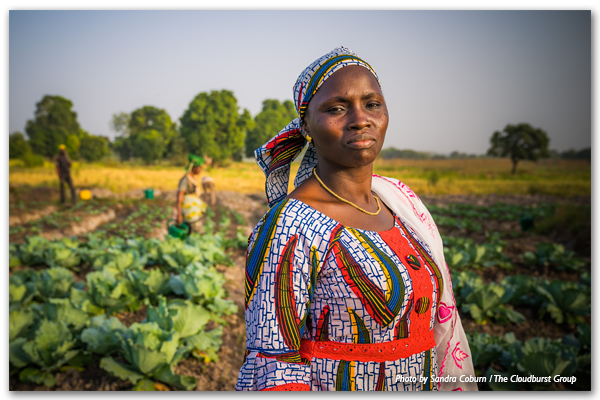 This type of proactive resistance is an increasingly common sign of the growing power of organized West and Central African rural populations to defend their perceived rights to customarily-owned lands. A valuable lesson from PRADD II and CBRMT is the understanding that more attention should be focused on how to manage conflicts over who controls and manages rights of access to both surface and sub-surface natural resources. Training in conflict management cannot be directed solely to government officials; such capacity building initiatives must also include powerful traditional authorities, artisanal miners, civil society and actors within the private sector.